Meets Air Force Association Victoria, 24-36 Camberwell Road, Hawthorn East. Meeting dates advised in the Catalina newsletter or contact the President. The weekend of March 17 - 19 saw the 75th Anniversary Celebration of the Lake Boga No 1 Flying Boat Repair Depot (1941 – 1947). Member Jennifer Newton attended and presented this report. Lake Boga Flying Boat Museum with a static display of Catalina A24-30 inside. The event was conducted most admirably by the Lions Club of Lake Boga who have proudly taken this entire project as their responsibility. They are to be congratulated for their continued resolve towards creating what is now a complete visitor experience in their area, and to be highly recommended. It was a fully involved community event, with multiple food stalls provided by amongst others the local school, Rotary and CFA. Many other organisations were proudly representing their projects. 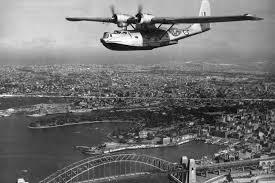 It was most unfortunate that the weather in the NSW area precluded the departure of our only flying Catalina to arrive at the event. The flying program for the day included a visit by the PC-3 Orion from Edinburgh SA, the Roulettes who did an amazing aerobatics display, a T-28 Trojan Grumman Avenger, Wolf Pitts and a local aerobatic display from a group of 3 Pitts specials, which was spectacular. Allan Arvidson and Jennifer Newton represented the RAAFA Catalina Branch at the Remembrance Day Service in the grounds of the Heidelberg Repatriation Hospital (Austin Health) on Friday 11 November 2016. More than 600 were in attendance, including children from Ivanhoe Primary School and the Austin Hospital crèche.